Posts 1 through 4 for isaacson Sends in a 39 Incher form LOW! isaacson Sends in a 39 Incher form LOW! - - - 4 messages. Showing 1 through 4. Nice fish! ! That would be fun! thanks t bone it was fun.it was a little weird we were in 26ft i just was just dropping my line it was only 6ft below the ice and i thought i was snaged on the ice so i pulled on it and then the fight was on.he tangled every line in the house.it took 7 times befor i could get the head through the hole. I don't target the northerns much but I have noticed that most big ones I catch are near the ice.. The biggest pike I have ever seen was only about two feet below the ice and it slowly lurked by my hole. I swear it was a twenty pound Northern, right in Rush lake. It didn't care too much about the wax worm in front of his face. 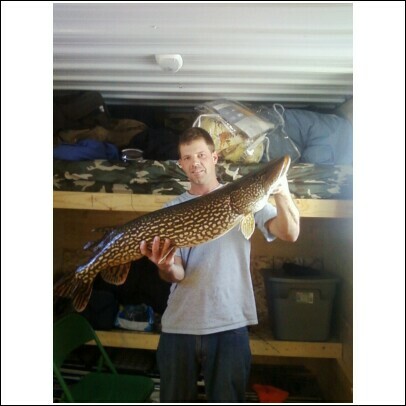 I would love to catch a pike like that.